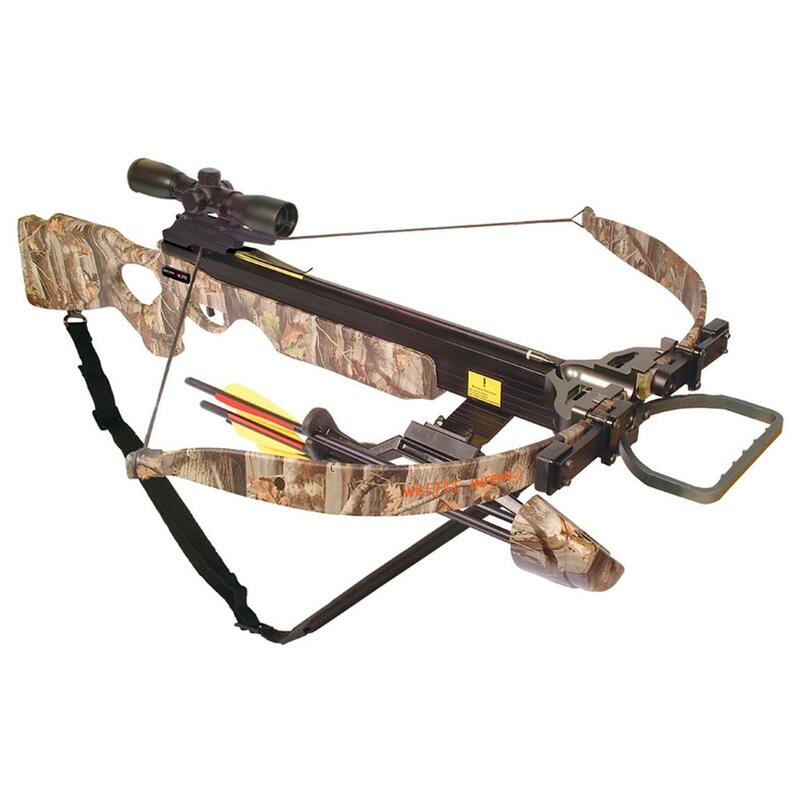 Crossbow Academy: ballistics, sighting, tuning 20" 39.5" / 7 lbs. - None that I’ve noticed Small Game Hunting? I must say the instruction booklet was surprisingly detailed – it includes LOTS of HD pictures and explains the assembly process in more detail than even a beginner will need. They recommend first tightening the riser assembly screws (I missed this step because I’m not used to doing it, but it’s probably a good idea). Align the riser assembly with the stock and push the two together, then secure the connection using the provided Allen key. Next, install the foot stirrup and make sure the two connecting screws are tightened very well, as this part of the Inferno Wildfire II will be subject to lots of tension. You’ll now need to attach (two screws) the quiver mount, mount the scope, and finally string the crossbow; that last part is explained in great detail with pictures in the instructions, so I won’t even go through it – suffice it to say that the procedure is exactly the same as with any other recurve xbow. Unless you can repeatedly dead-lift 225 pounds (the draw weight on this crossbow), then you should forget about manual cocking and make sure to use the rope aid that came with your package instead. Make sure you’ve got the lube wax with you as you will need to apply it to the string and arrow track every 5 to 10 arrows fired, otherwise the string will wear out too quickly and other damage may ensue, particularly to your arrow shafts. The cocking procedure is exceptionally smooth despite the forces involved. Arrow Precision’s bolts come with a half-moon nock, so make sure that the string is aligned properly with the groove in the back of the arrow. This is probably obvious, but beginners may not know so I will mention it: don’t ever dry fire the crossbow (never pull the trigger if no arrow is seated). Dry firing will cause the limbs of your crossbow to vibrate excessively, leading to them cracking or outright breaking. This will also automatically void your Arrow Precision warranty. The Wildfire II is pretty much devastating, and probably the most powerful bow on the market that you can get in this price range. When target shooting make sure to always have a proper back stop behind your target, as the arrow will go right through a lot of materials of varying thickness. When using compressed-foam targets, the arrows with the 100 grain field tips were digging in a good 7 inches into the target when shooting from 25 or 30 yards. It’s perfectly accurate too and I’m willing to bet that a complete beginner would be capable of splitting arrows on command from a 15-20 yard distance, given a few days of practice. You can easily shoot from 100+ yards away and still achieve decent target penetration, though obviously you’ll need to have quite the eye to hit the bulls-eye from that far away. As you can imagine, this kind of power is a dream for a hunter. At 7 pounds, the Inferno Wildfire is not the lightest xbow (though definitely not the heaviest either), and the padded string included by Arrow Precision was more than a welcome addition. It let’s you pretty much focus entirely on tracking your prey, while forgetting that you have a crossbow with you – until you need to shoot it of course. There really is no type of game in the States and Canada that you can’t take down with the Inferno. Bear, elk, whitetail, and even bigger game (when/if legal) – if you can land the shot accurately from even 40-50 yards, it’s dead meat. I haven’t had a chance to hunt with it myself as I only bought it in January 2013, though I’ve accompanied a friend last year who successfully harvested 2 elk and I can say that this is one of the fastest, most powerful, and quietest recurve crossbows I’ve ever seen in action (and I’ve seen quite a few). Now for what I’m sure you’re begging to ask: how hard does the Arrow Precision Inferno Wildfire II hit the target? Using 400-grain arrows from point blank range, the arrows hit the target at around 340 fps. This yields a kinetic energy output of a whopping 106 ft. lbs. worth of power, more than enough KE to take down even the toughest game, like Cape buffalo or grizzly bear. Of course, you’ll lose a few percent ft. lbs. of energy for every 10 yards beyond point blank range, but you can still expect to get 98 ft. lbs. of kinetic energy out of your typical 30-yard shot. The package came with a 4×32 scope that in itself is good enough to deserve a separate review. 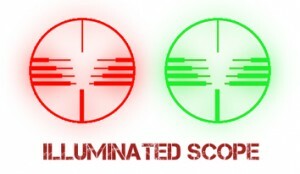 It’s red/green illuminated so will make aiming easy even in misty or poorly-lit outdoor conditions. There are four reticles in total, the first of which should be sighted at 20 yards, with the remaining reticles being automatically set for 30, 40 and 50 yards,respectively. 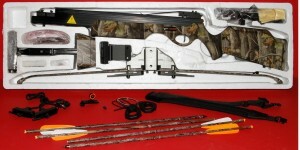 See our crossbow sighting guide for more details. Arrow Precision’s scope runs on a 3 volt lithium battery; it’s the small/flat kind that looks like a coin. Don’t forget to always carry a spare battery, and to turn off the scope whenever you’re not using it to conserve battery juice. As far as accuracy goes – you’re really not getting a better scope than this with a crossbow, not even if you buy a much more expensive package. It holds zero for a VERY long time without the need for even the slightest windage/elevation adjustments. If you’re familiar with crossbow sighting procedures, you’ll probably get it zeroed in 2 or 3 shots at most. Whether you call it bolts or arrows it’s pretty much the same thing (when crossbows are concerned). I received four 20 inch carbons with my purchase plus four 100 grain field points. You can also use aluminums if you like (20″, 2219), though for these you’ll need to use 125 grain field points. Please remember that when purchasing hunting broadheads, they should be of exactly the same grain as the field points for your crossbow – in this case, 100 grain for carbon shafts and 125 grain for aluminum shafts. You can get slightly heavier broadheads (though this will reduce the FPS of the Wildfire), however never get lighter ones. Please refer to our hunting broad-heads guide for more. What Crossbow Case Fits the Arrow Precision Inferno Wildfire II? Since the Inferno Wildfire II is a recurve and somewhat larger it is more difficult to fit it to a case. The Plano 1133-00 Manta Crossbow Case is a good choice. It is quite expensive but well worth the money. 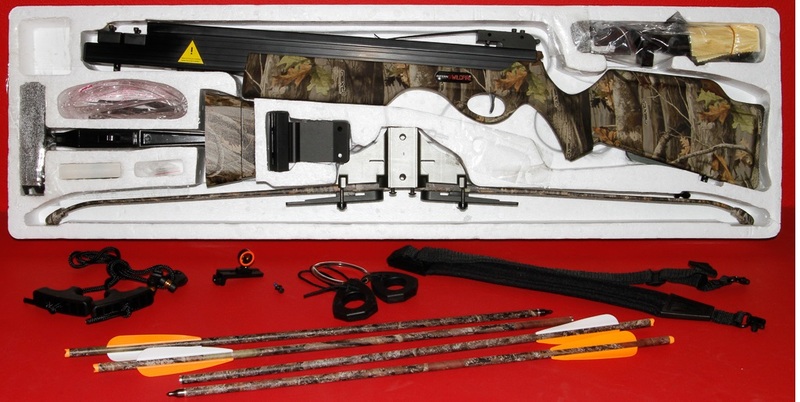 This crossbow is perfect for hunters and will do a hell of a job at the range as well. The type of power, accuracy and comfort the Wildfire II provides usually cost much more than what Arrow Precision is asking for this model. 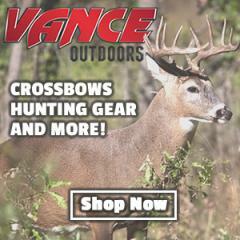 If you want to go hunting and want a good balance between price and quality, get this one — and use the extra cash to buy some broadheads and a few extra arrows; you’ll be better off for it. Take a look at today's amazon.com price on this crossbow and check out our top 10 crossbows rankings for more.